Seems like just yesterday street racing was all the rage! Street racing and its culture are at the forefront of The Fast and the Furious, and it is a culture that has its own code and social mores. It is a culture that LAPD officer and FBI agent hopeful Brian O’Conner (Paul Walker) has been infiltrating for months. 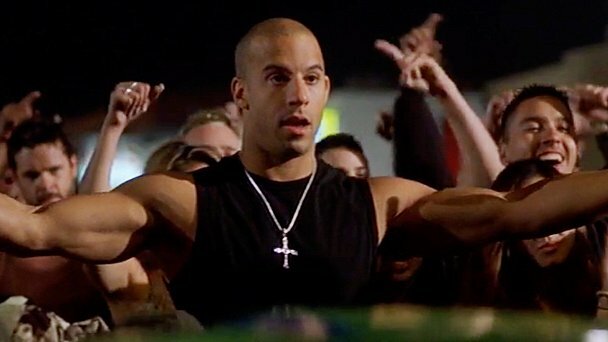 On the LAPD’s radar is a street gang led by a man named Dominic Toretto (Vin Diesel), who all are prime suspects in a recent wave of stolen high priced electronic items from big rigs. As O’Connor gets closer and closer to thine enemy, his loyalties become tested, not just to Dom but his sister Mia (Jordana Brewster) as well. Perhaps Brian is better suited for this street racing thing in comparison to enforcing the law. Yours truly isn’t ready to say that street racing is dead (I live in the Midwest now instead of the West, a area in love with street racing), but it may not be too crazy to say that interest has been waning for a while now. There was a time where it seemed like many I personally knew romanticized the culture and the life, as well as hailing The Fast and the Furious as the best movie of all time. While that last statement is probably pushing it ever so slightly, even 13 years later, TFATF is still a cool and pretty entertaining 106 minute ride to watch. While it is an entertaining flick that spawned a lucrative franchise with tons of fan support, this franchise doesn’t cater to a vast audience like say the Marvel movies or the Harry Potter movies do. It really is less “inclusive” from a moviegoers standpoint than the average action. Chances are if the first did nothing for you, you never came back to the franchise or have any inclination to do so even with the later changes. 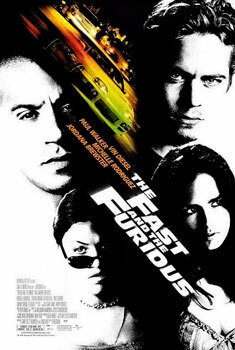 As for the actual movie itself, while TFATF may be a bit dated with just how much it focuses on street racing, subsequent culture, and a possible over-glorification of such a dangerous practice, the culture and racing aspects are captured in great detail by director Rob Cohen. Here, Cohen appears to be successful in detailing the atmosphere of what illegal racing and the underground scene is like. Even if some details are not in line to what occurs in the everyday scene, it isn’t hard to imagine that the popularity of the film may have influenced the real life happenings in the subsequent years after the release. Most importantly, he has a flair for filming one of the more important hooks in the movie: the racing. He utilizes the right effects to create a real sense of speed and acceleratio , which is amplified by the unique colors found here. This is not a dull-looking film from a tint perspective, with all types of greens, oranges, yellows, and warm filter throughout, and they seem to “pop” which seems to give even more speed to all of the numerous races and fast-paced moments. There’s a story in The Fast and The Furious, but as expected it is pretty basic, but also adequate and functional. No one would ever describe it as deep and meaningful, though surprisingly, family and being true to one’s self are done at a fine and un-cheesy or sappy level. Between the racing and action scenes, they exist to make TFATF a sliver more than balls out adrenaline and machismo. Now, the actual writing on the other hand as it pertains to dialogue? Let’s just call it mediocre at best and stuck in reverse at worst. Again, it is unreasonable to desire a high quality of talking with a film like this, but man, talking about the tuna, how one stands by their car, and never “narcing” on nobody carries a high amount of cringe with it. Yours truly just rolls with it; it is one of the film’s (and franchise’s, really) calling cards, and at this point the stuff works well as unintended comedy. Anchored may be an incorrect description, but TFATF puts most of its focus on Vin Diesel and Paul Walker. In regards to their acting chops, neither possesses supreme talent but both are fun to watch in the right environment, like so here. Despite a lack of great skill, both do have a real screen presence about them and always have, and seem to be at their respective bests when in the F&F universe. Walker and Diesel show the makings of a good rivalry/partnership in this first installment, and for whatever limitations had they don’t seem to matter much here. The rest of the cast supplements these two nice enough, even if they are stereotypical to an extent. The only performance that stands out in a bad way is Michelle Rodriguez’s, who doesn’t even look like she is trying much at all, probably because she is the same character in just about everything she finds herself in. Yours truly probably hasn’t said anything that would be shocking to anyone who is reading this. For some, these movies will always be treated like poison to the film industry beginning with this one, akin to a Bugatti or Ford E-150 being bad for the environment. For others, The Fast and the Furious is a supercharged, NOS-fueled ride with more than enough under the hood to power across the finish line in good shape. Photo credits go to wikipedia.org, furiouscinema.com, and speeddoctor.net. The one that started it all. This series is a real mixed bag, but is committed to the universe it lives it. For that, it can be a lot of fun. Nice, honest review. Thanks man. I agree about the mixed bag, but I think the franchise has been trending very up since 4 brought the key players back, though 5 really was the game changer. Excited for 7, and should have my other thoughts posted on the other 3 I’m missing before it. I really enjoyed 6. Just felt like they got the formula exactly right. 5 had done great moments too. Looking forward to 7. Agreed. Fast Five was really fantastic, and I’m looking forward to the next movies as well. Always shamelessly loved this franchise! I really enjoy this franchise a ton as well! On over the top stunts and action thrills not many franchises as a whole top it.